It’s Chanukah giveaway time! We want all of our readers to to have a chance to win this gift so we’re running this contest as a real quickie. Jump right in! One lucky reader will win a copy of Koenig’s cookbook, Little Book of Jewish Feasts, this week. We’ll rush it right out to the winner so (hopefully) it will arrive during your week of celebrations. 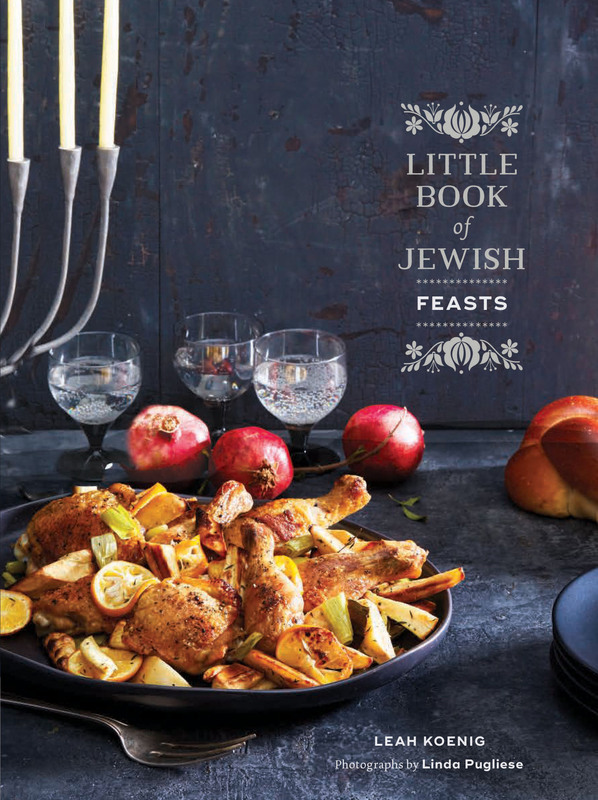 Did you see our post about Leah Koenig’s latest cookbook, Little Book of Jewish Feasts? Scroll down to find her crunchy Poppy Seed Schnitzel recipe, along with all the reasons why we think you’ll love this lil treasure as much as we do. Leave a comment below, telling us what your favorite type of latke topping is. Are you a classicist? A zesty sour cream lover? A lover of zesty sour cream? A chutney kinda gal or guy? We want to know. Gain more chances to win by responding to our contest on facebook at KosherLikeMe and on instagram @kosherlikeme. That’s it! This contest will run from 12/3/18- 12/5/18 at 1:00 PM, EST. USA mailing addresses only, sorry. **** Please expect a delay in seeing your comment pop up below. For security, Liz approves each and every comment so we can all stay safe. Good Luck and Hag Chanukah Sameah! My favorite topping is homemade applesauce. Nothing storebought can compare to the warm delicious taste of fresh applesauce oon a crispy hot latke on the first night of Chanukah. Latkes, Latkes, with sour cream, or apple sauce, home made applesauce with a little cinnamon. Regular potato latkes or sweet potato latkes. It doesn’t matter as long as there are latkes. The choice between latkes of sufganiyot, latkes with apple sauce will win each and every time. The perfect topping depends on the latke. Classic potato latkes require classic toppings like applesauce and sour cream. When I make something more exotic like curried mixed veggie latkes I choose more interesting toppings like avocado crema or chutney. Sour Cream all the way home!!!! On sweet potato latkes with scallions, honey mustard is the all-time best! sour cream, sour cream and even more sour cream. Ok, sometimes lemongrass-seasoned yogurt. Applesauce all the way! Add a little cinnamon, and I’m good to go! sour cream every time, and latkes made with potatoes and zucchini, and sweet potato latkes, with of course, sour cream! Sour cream or Tofutti sour cream for meat meal, cinnamon apple sauce and a dollop of homemade cranberry sauce on top. Gorgeous AND yummy!! I’m old fashion. I love plain apple sauce. or just plain latka. Cranberry apple sauce tastes great!!! I take a page from Ottolenghi when it comes to latke toppings, which means full fat Greek yogurt mixed with cilantro, garlic, lemon, kosher salt. Delish! Homemade apple/pear sauce-a recipe from the 92nd St Y when my daughter was a toddler! Applesauce made in an Instapot with Mutsu apples and frozen organic dark pitted cherries! It seems that each time i eat them, i enjoy another variety of topping….yes to sour cream and yes to chunky cinnamon apple sauce,….but my latest is guacamole with them….a terrific variety….thank you for this opportunity. NOTHING beats the taste of sour cream. . . . . . on practically everything! Sour Cream, Lox, Caviar, chopped scallions and Dill. Must be apple sauce….only way to go with a peppery potato latke. Hannukah Sameach!